Let me preface this with a quick note that this is NOT an April Fool’s Joke. I don’t do those and you’ll only get sincere queerness with a chance of explosions from me, so there’s that. Anyway, a few things to start off this month, which happens to be my Birthday Month (my birthday is April 5), so double yay for that! First off, I want to make sure to regularly check in with you all in from of monthly goal posts again. This is something I used to do, mainly to keep myself accountable, but also because I feel like it helps making these things public, both for my own accountability and to share more about the writing process and its accompanying struggles. So gear up for monthly goals and recaps on the first of each month. This is my priority this month, because I need this story to be on my editor’s desk by June 1st and have spent the past months extensively outlining and researching things, so it’s time to whip this into readable shape. April, and by extension, CampNaNoWriMo, is for that. My goal is to have a first draft done between April 10 and 15 and to have the first round of content edits done by April 30. 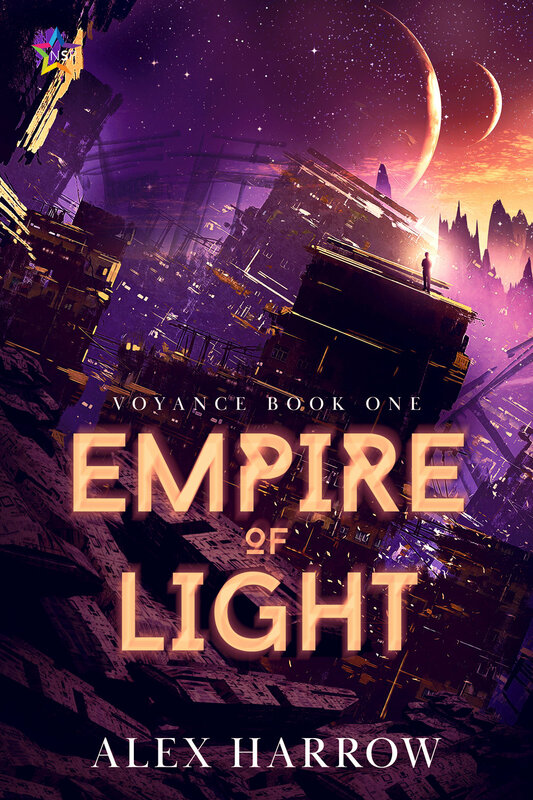 Yes, this is the sequel to EMPIRE OF LIGHT, and yes, this story has been living in my brain for YEARS and I’m beyond stoked to get it all out, so April is when it starts. My goal is to start officially writing this by April 15 or as soon as I finish rough drafting Weaver of Ink and Stars because I want to be in a space where I can draft one project while editing the other. Prepare for 4 a.m. mornings and lots of writing sprints on my part. Connect with me on Twitter or Google Hangouts if you need a sprint or accountability buddy! Okay, maybe this is cheating, but the first step in this goal JUST happened last night: you can now support me and my writing via Patreon here. I am going to use this platform to release monthly short stories and flash fiction in the Empire of Light universe, but also to share more targeted and in-depth essays on craft, gender, and all things queer speculative fiction. I’ve been planning to do this for a while now and my birthday month seemed as good as any to finally get that off the ground, so if you want more queerness with a chance of explosions, please consider supporting me on Patreon. Bonus: all new patrons who sign up during the month of April will get a swag packet with a signed bookmark, postcard, and a character art sticker of either Damian, Raeyn, or Aris (your choice). I’ve already posted the first part of an all-new prequel short story featuring your favorite crotchety space pirate, Iltis, called “All In.” Check out a snippet here and head over to Patreon to read the rest! Also, if you financially can’t support me right now, please still consider voting on what flash fiction prompt you want me to write for April. This is usually for patrons only, but because I’m just starting out, this post is available to vote for everyone, so get your vote in now. Okay, one month, thirty days, three goals. LET’S DO THIS. I’m ready for April. Are you? What are your goals and projects you have in the works? Tell me about them in the comments!